Real women who live in Lugansk that you can actually MEET during your exciting singles tour! Finally! The tour city that many of you have been asking about is finally here, Lugansk, Ukraine (coupled with Mariupol). This tour promises to be very special as it is the first time ever that we have done a Tour/Social in Lugansk - the first time in any city is always very special and by definition, only happens once! I was just in Lugansk in December of 2011 for about a week and I have to tell you that some of the most beautiful women in the world reside in Lugansk. I have been in this business since 1995 and have visited numerous cities from all around the world, but I have to tell you that I was extremely impressed by the women I saw in Lugansk. Just walking down the street, going to the store, or a shop, it didn't matter, there were absolutely amazingly beautiful women everywhere I looked and it seemed as though the women outnumbered the men at least by a 2 to 1 ratio! I sat at one cafe on the main street and just watched as the people walked by - it was like attending an outdoor fashion show, simply amazing. Unfortunately I do not possess the skill or proper vocabulary to adequately describe the experience, this is simply something that you have to see and experience for yourself! Lugansk is situated in southeastern Ukraine, not far from the Russian border. It is a city of just under 500,000, relatively small by Ukrainian and Russian standards. What it lacks in size it more than makes up for in beauty. Not just the women who inhabit this wonderful city, but the city itself is very charming. There are numerous restaurants, cafes, nightclubs and entertainment centers. One thing I noticed about both the men and women of Lugansk is that they seemed very happy. You can just see it in the way they carried themselves and interacted with each other. There is a small town feel to the city, yet it is large enough to offer everything a tourist would want, and more! Although, speaking of tourists, that is one of the things I also really like about Lugansk, there are not a lot of tourists running around this city. A foreigner here is still quite a unique occurrence. True, you won't find menus in English, nor will most of the hotel staff be conversant in English, but again, you are going there to experience a true Ukrainian city and meet some of the most beautiful women on the planet. I will say that roughly a little less than half of the women at the social will have some level of English, with some being fluent. This tour begins in Mariupol which is also a very beautiful city with hundreds of very interested and beautiful women. We will do the first Social in Mariupol, and after a few days move on to Lugansk and conduct the second social there. Mariupol is only about a 3.5 to 4 hour drive from Lugansk. 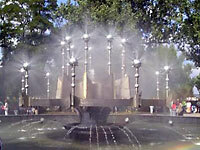 We have done tours to Mariupol in the past and they have always been very successful. You will get the opportunity to meet beautiful, educated women in both cities via the socials and the one-on-one introductions. This is a really fantastic opportunity for those of you who would like to go on a tour that is somewhat "off the beaten track". There are not a ton of men going to these two cities in search of love, but trust me - the women will be very pleased that you decided to choose their city for your search for that one special person! Remember, you can't MARRY these stunning women if you don't MEET them! 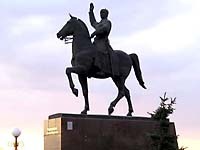 Lugansk is a wonderful destination that you will want to be certain is on your list of tour cities!